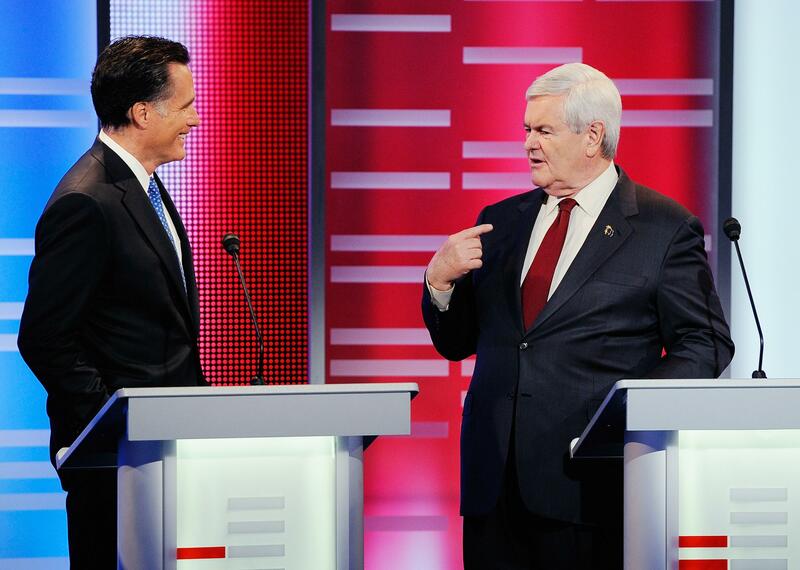 Newt Gingrich and Mitt Romney have spent the day engaged in a shooting war over their private sector experience. Let’s start off with an understanding: Mitt should win an argument like this. He has been running, all year, as a “business guy.” He leads speeches with talk of his years at Bain Capital, not his four years governing Massachusetts. Newt Gingrich’s private sector experience began when he left the speaker’s office. Paul laughed out loud at the answer. It’s hard to buy into, and in the past – like at the Lincoln-Douglas debate with Herman Cain – Gingrich only really got away with it because he was debating someone who didn’t want to (or know how to) parry it. The Romney campaign hit Gingrich today with a statement from Tom Stemberg, founder of Staples, one of the companies whose growth Romney takes some credit for. Newt Gingrich comes from the world where politicians are paid millions after they retire to influence their friends in Washington. Mitt Romney comes from the private sector, where the economy is built by hard work and entrepreneurial drive. It’s clear that after 30 years as a Washington insider, Newt Gingrich has no clue how the real world economy works. After 25 years in business, Mitt Romney understands how jobs come and go, and what we need to do to get our economy back on track. If Newt Gingrich is our party’s nominee, the choice in next year’s election will be between two professional politicians, two Washington insiders, two people with no experience in the real world of job creation. Gingrich’s response to this? Believe it or don’t, but he’d adopted the attack on Romney that Democrats used in 1994 and 2002 – that Bain made money not through job-creation, but by job-killing turnarounds. I would just say that if Gov. Romney would like to give back all of the money he’s earned from bankrupting companies and laying off employees over his years at Bain, that I would be glad to listen to him. I’ll bet you $10, not $10,000, that he won’t take the offer. Does this make sense? I’m not asking if it makes sense as an attack – does the logic train chug along from station to station, or not? Shaming a businessman about the people he’s “bankrupted” and “laid off” sounds like the work of an Occupier, not a private-enterprise loving conservative. Yes, it’s true that Bain was not a job creation machine. Romney’s being disengenuous when he says it was. But there’s a perfectly respectable conservative ethos that defends what Bain did, arguing that the only responsibility of a corporation is to make money. This is something Steve Jobs talked about; it’s a reason he snorted that Bill Gates was “more comfortable in philanthropy” than in innovation. Given a chance to attack Romney, Gingrich suggests that there was something not just mean, but unfair, about Romney making money by maximizing profit for Bain. But he suggests implicitly that his private sector life – collecting money from large donors to give speeches and consult on policy – was ideal.